Manners: Propurr and Polite Is Right! Never make rash and crash decisions cuz dats not good manners. When youza hanging out, hanging up or hanging down with no paws on the ground,stop fur a mini meowster second and look to da left then look to da right and take yur time fur da free fall. Itza good manners and impurrtant to always watch yur water consumpshun from da start, cuz youza never ever too old or tooza yungun to be environmentally correctacat. Daily good manners is to be da inspectacat and divide da trash so youza recycles correctacatically. Be shure to always check out da water level in yur flower vase or yur BeeYouTeeFull flowers gonna not be too purrty when da water level izza below da "Stop! Yur Smitten Kitten self has drinked all my water!" baseline. Itza purrfecto manners to not get boxed in, always keep yur options open and be shure youza has a view of everything frum everywhere. Yep uh huh, youza wanna see frumza inside to da outside and sneak da peak back in. Itza definicatically impurrtant youza sees whatza going on frum all direkshuns - that eliminates youza having a surprise from somewhere! If youza mature meowster or yungun or da secret age cuz youza not gonna tell, justapurrractice da manners cuz youza gonna be a contentacat and purrsons gonna have da respectacatable OhPinion of youza tooza. NOWza MEOWza go and have a fantasticat nonCATastrophic week! 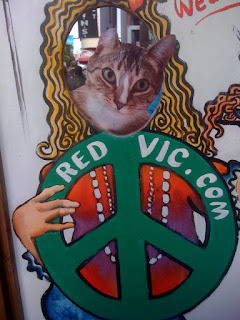 Itza retrocat times fur me and my paws when I dances and purrances to da mostest famous intersekshun in the world: Haight & Ashbury in San Franfuncisco and fur shure, some things justa never ever changes - kinda like cats being da creatures of habit. Everybody izza super dooper furiendly in The Haight cuz thatza where theyza invented PEACE, LOVE & Brown Rice too. Yep uh huh it'za furiendly and great since 1968. I wazn't born then ... wazza youza? Lookie at whatza popping out of da window! Catzowey! Call da Mewspaper and Pappurrrrazzi. Sheeeza definicatically in need of a Man Cat to save her! Do The World A Flavor - and youza and yurza can help Ben & Jerry's name a new Ice Cream here at BEN & JERRY'S WEBSITE . Oh I luvs chilling out at Ben & Jerry's at da Innersekshun of Haight & Ashbury! Itza da mostest meowvaloso bizziest Ben & Jerry's in da whole wide wonderful world - cuz everybody is hunky happy dory! Order a Chunky Monkey on a cone but not if youza pooch! The giganticat growls da giorno rev up when I sees this sign in da Ben & Jerry's andza Jerry's & Ben's window on Haight Street. Whatza they thinking? But catzowey itza cat furiendly so datsa funtasticat news! So I orders da double dippity cone TO GO in the organicat (nachurally itza green carry out bag) fur my pooch pals. When youza comes to San Francisco, be sure to where da flowers on yur fur. Yep uh huh datsa what da 60's singer composer Scott McKenzie sang waaaaay back in da days of when Peace, Love and Jefferson Airplane was all flying high! (hee hee hee and a hazatini too). Andza here's me andza myself atza da Red Vic Inn. Itza old - really old like itza had way more than 9 lives cuz a whole Millennium ago in 1977 Signorina Sami Sunchild acquired the Red Vic, built as a hotel in 1904, and her Flower Power self turned it into da Inn. Datza brilliant & furiendly thing tooza dooza and itza purrobably got kitty beds and sunrays too. Sheeza got peaceful rooms, a Peace Dining Room, youza name it, sheeza into giving peace and itza furiendly fur da vegacataterians and da vegans and da organicats and thatza increducatulously nice. Nowza YOU go and have da meowvalously peaceful week - yep datza what I wishes fur youza! Eye To Eye - OH Mio OH My! Every two years youza supposed to trot yur paws to da Optactamologist to get yur eyes checked or fixed or renewed. Whatever youza duz, youza gotta take dat Eye To Eye Chart testaroni and it can definicatically rev up my EyeTailYun testosterOHknee! Cuz I gets impayshunt taking da tests and reading dat inky dinky print. Andza da Doctor doesn't speak EyeTailYun. BUT when I finishes da Eye examinayshun, I gets a purresent for passing da test and I sees that purrfectly! Check out this giftie bag I'ma opening up and around and tossing down! Catzowey itza meowvaloso like da giftie bags da artistocats and red carpet celebricats receive at da Academy Awards - woo hoo life izza CATZOWEY fur shure with da giftie bag galore. Basta Pasta and Holy Cannoli! Itza giftie bag filled with abundacat impurrted NIP and Pipecleaner Bees fromza somebody's nachurally wonderfully wild and organicat garden, Ahhh and ohhh how I luvs da great grown NIP snipped with careful caring paws. Thizza izza more meowvaloso than a faux Rolex or a Gucci-Cat bag! My giftie bag deeziner collar izza custom made by CALVIN and if youza wants to purrchase one or get infurmayshun youza can checks it outta atta Calvin's Store - tell him Guido sentcha and youza FOG "Friend of Guido" - I purromise he wontza charge more! A meowvaloso tip of da meowment: Never ever gives up when youza wanna gives up cuz youza might just find da end of da rainbow or da goodies in da bottom of da giftie bag, exacticatically when youza not giving up. Categorically speaking, I'ma here to ear to tellza youza dat IF youza not passing dat Eye To Eye Chart test then youza gotta tell a furiend and datza not a purroblem cuz furiends izza what ya needs when youza needs to unload da load of not good mews and news. And if yurza MasterCat card izza maxed out itza no purroblem cuz da furiends listen fur free! Me and Myself wishes youza da mostest fabuloso CATZOWEY and nonCATastrophic week! NOBODY izza ever gonna take a purrfecto foto 100 purrcent of the time, and I knows youza thinks I'ma Hair-Brushed or fixed up by my Staff in my fotos. Go ahead and admit datsa what YOUZA thinking on Mondays when The Guido Gazette arrives. But it's notta true one meowment, so here's some of my favorito "OOPSATINI Ita Faux Paws Meowments" caught by the fotographer. Kick back, relaxacat da paws after da 4th of July with some more old leftovers that duzn't wanna be leftover till Wednesday, and get ready to have a doggone meowvalous howl. Yep uh huh, itza fur shure youza gonna see actualicatically dat sometimes I has abundacat ups and downzatinis with da fotographers! WHATZA youza mean my catzowey creamy Catpuccino is not brewed yet? Dontza fotograf me when I'ma flossing my Feline teeth! Shut dat camera off NOWza puhleeze! Yep I'ma having da giganticat Hiss Fit cuz my Mani-Pawdicurist wazza supposed to be here last FurEyeDay! Time to fire and re-hire. Anybody wanna apply fur this pawzishun as my purrrsonal Esthicatishun & Pawdicurist? Finally after a meowsage I'ma having a pawsative meowment: definicatically not thinking of these OOPSATINI Faux Paws meowments of flubbed fotos! NOWza MEOWza, I wanna you to have a nonCatastrophic week and youza might wanna thinks about what exacticatically putza smile on yur fine furiendly face - yep uh huh! Like purrhaps a full box of Mice A Roni, the San Franfuncisco treat! Can youza mingle while youza hums da jingle? Click on dat Mice A Roni link and yurza paws izza gonna be tapping all day!